This meatless Tortellini Vegetable Soup made with cheese tortellini, Cannellini beans, plum tomatoes and spinach in a vegetable broth is hearty and delicious. 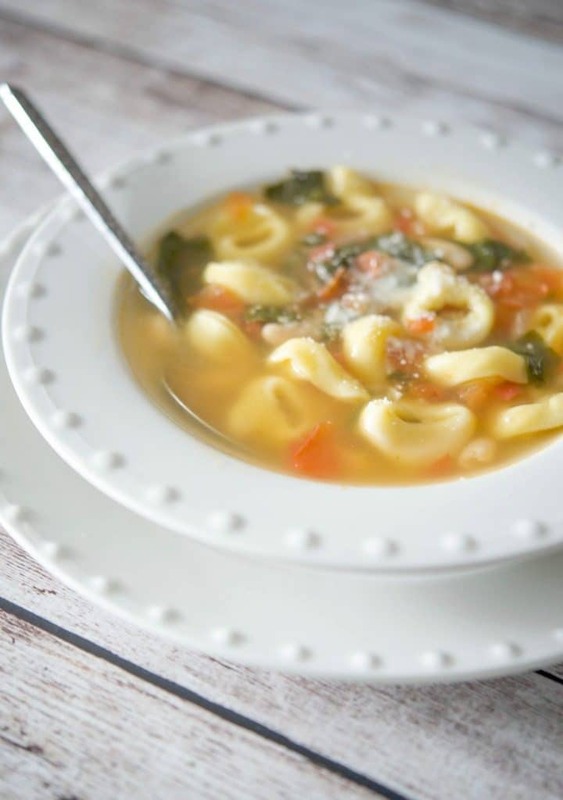 There is one thing my family craves when they’re under the weather even more than pastina…soup! Over the last few weeks the sick bug hit this house in spurts ranging from low fevers to upset stomachs to sinus infections. Because you’re really not in the mood to eat anything heavy, yet are still hungry or have to eat something due to taking medication, soup fits the bill every time. I don’t know about you, but for me, there is only so much chicken noodle I can eat without looking for a variety. 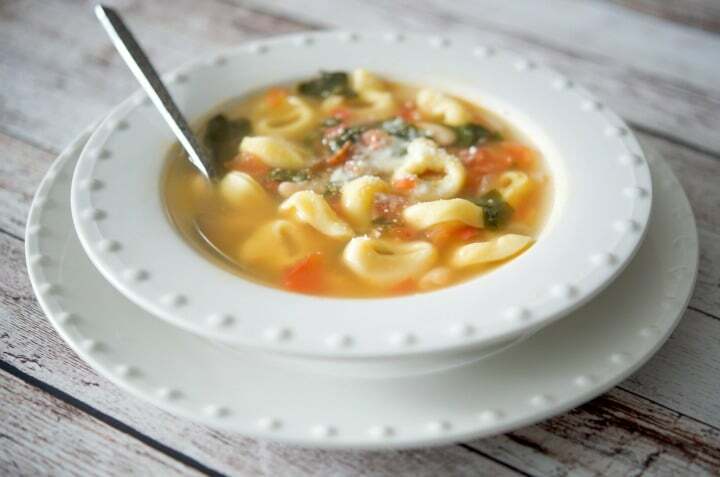 This broth based Tortellini Vegetable Soup was perfect and simple to make. For this recipe you’ll need extra virgin olive oil, onions, garlic, plum tomatoes, spinach, cannellini beans, vegetable stock and tortellini. I used frozen cheese tortellini for this recipe, but I’m sure the dried or fresh tortellini would be fine too. Also, if you don’t care whether or not this soup is vegetarian, go ahead and use chicken stock in place of the vegetable. To make this soup, first pull out your Dutch oven or large pot. I prefer to use my Dutch oven whenever possible; which is a coated metal pot with a lid. It holds in the heat beautifully and when making other types of food, the coating prevents food from sticking; not to mention it’s easier to clean. Add a bit of oil to your pot; then add chopped onions, garlic and tomatoes. Sauté for a few minutes until the vegetables start to soften; then add your vegetable stock and water. 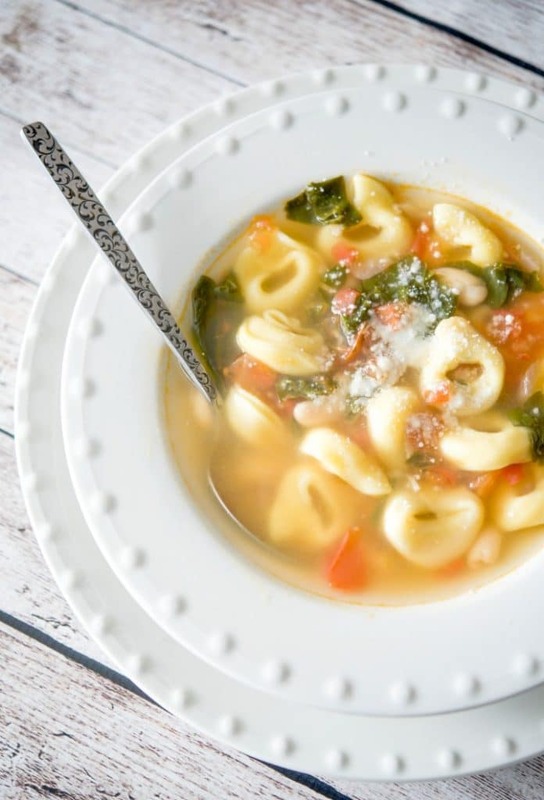 Bring the soup to a boil; then add fresh baby spinach, cannellini beans and tortellini. Reduce heat to medium and allow soup to cook for approximately 15 minutes until the tortellini is cooked. If you’d like, sprinkle with some grated cheese and serve with crusty Italian bread. YUM! My family; especially my husband, couldn’t get enough of this Tortellini Vegetable Soup and must have said a dozen times how much he enjoyed it. This recipe serves 6 and can be ready in about 30 minutes. Just what you want when you’re cold, tired and not feeling well! 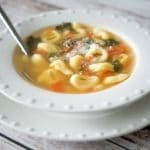 If you love soup with tortellini, try these recipes for Tortellini en Brodo and Tortellini Escarole soup as well. ~Enjoy! Place oil in a Dutch oven or large pot; then add the onion, garlic and tomatoes. Next, add the spinach, beans and tortellini. Cook over medium heat until the tortellini is cooked or is floating on the top. This soup looks like perfection! Light, but still filling thanks to those perfect little torts. Totally saving this one!